Even though it was a dog biscuit, anything that smells that good baking has got to taste amazing, right? Y’know, I should probably back up a bit here. Last year our Anatolian shepherd, Riker was having skin issues. The poor guy had allergies and infections. He was miserable. Licking, chewing, and scratching left him looking like Chupacabra; balding and kind of scary. While our vet worked on getting him over it with medication, I decided to see what I could do from our end. His kibble was as simple and healthy as could be purchased. I cut out all table scraps, and looked at the one other thing he ate regularly—his doggy treats. We’d been giving Riker chicken jerky. I’d heard something about problems with chicken from China. I did some research, and found out that thousands of dogs had been sickened, and many had died after eating the Chinese chicken. Frighteningly, our pup’s brand was sourced from there. I wasn’t sure if it was the jerky that was plaguing our pooch, but it got tossed that day. I decided to only feed Riker treats that I had made from scratch, so I knew each ingredient. Every month or so, I make a fresh batch of pumpkin-peanut butter cookies for him. They take about 20 minutes to get in the oven, and bake for another twenty. After that I turn off the stove and they sit inside until they’re completely cooled, so that they dry out and get crispy. And for whole time, they smell absolutely amazing. Somehow, putting heat to the combination of peanut butter and pumpkin produces a stunningly fantastic aroma. Because they sit for a while in a warm oven after baking, the house is perfumed for hours. And this is where we came in. I didn’t want to eat Riker’s biscuits, but I knew that a fragrance like that had to translate into fabuliciousness. I’d never heard of any recipes that used the combo, so I looked online. Bupkis. There were no recipes to be found. I decided there were two possible explanations for this. One: it had been tried, but the combination of peanut butter and pumpkin was so horrifyingly noxious that there was an unspoken agreement among the population of the earth to never speak of it. Two (and much more likely to my mind): that I was a straight-up genius. That future generations would speak my name in hushed tones of confectionary reverence. So it was up to me to come up with a recipe to test my theory. I ultimately decided to make a gooey butter cake. It’s a sort of cheesecake with a cookie crust, and a sweet, rich filling. 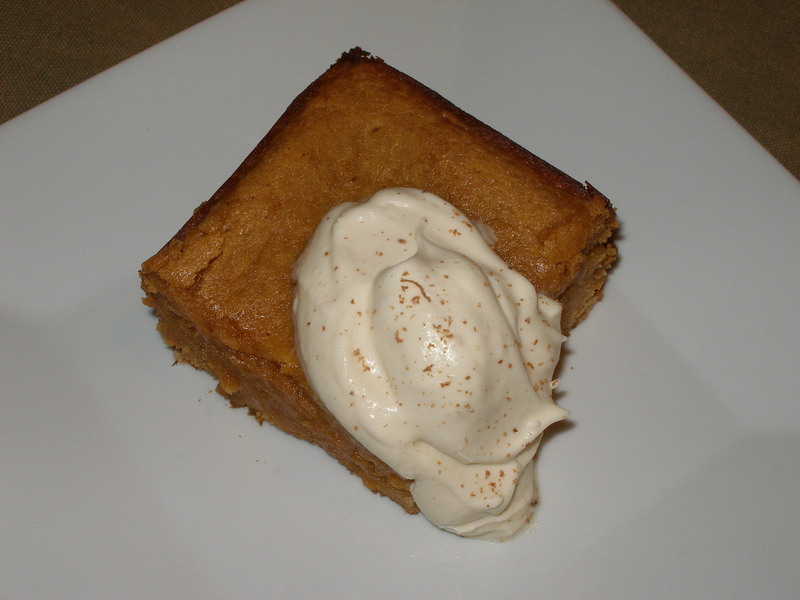 Peanut/Pumpkin Gooey Butter Cake with nutmeg flecked, honey-sweetened whipped cream. Preheat oven to 350. Combine the cake mix, egg, butter and mix well with an electric mixer. Pat the mixture into the bottom of a lightly greased 13 x 9 baking pan. To make filling: In a large bowl, beat the cream cheese, peanut butter, and pumpkin until smooth. Add eggs, vanilla, butter, and combine. Next, add the powdered sugar, salt, cinnamon, nutmeg, paprika and mix until smooth and glossy. Pour over cake batter and bake for 40 to 50 minutes. Don’t over-bake; the center should still be jiggley. Let cool before serving. If desired, top slices with honey-sweetened whipped cream. Baking it, the same amazing aroma filled my kitchen. I was crazy impatient for it to finish and cool. Finally I tried it. It tasted like flannel pajamas fresh from the dryer; warm and cozy. I’m not sure why nobody’s done this before. But I also suspect I’m probably not the culinary genius of my generation—darn it. And by the way, Riker’s skin is doing just fine.